Christmas Bells Are Ringing (A Medley Incorporating Ding Dong, Merrily On High, I Heard the Bells On Christmas Day & Carol of the Bells). Composed by Various. Arranged by Mark Hayes. SATB chorus. For Soprano, Alto, Tenor, Bass, Piano. Choral. Piano reduction/vocal score. Standard notation. 23 pages. Published by Carl Fischer (CF.CM8929).ISBN 082585766X. With Standard notation. choral. 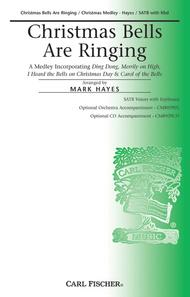 Christmas Bells Are Ringing composed by Mark Patterson. For 3-part mixed choir. Choral octavo. Standard notation. Duration 1:39. 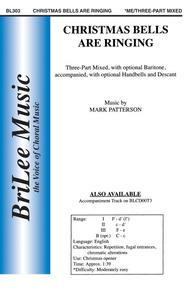 Published by BriLee Music (CF.BL303).With Standard notation.